Welcome aboard Royal Brunei Airlines! We wish you a very pleasant trip with RB. The months of May and June are filled with celebrations as Brunei Darussalam gears up for the festive season beginning with the blessed month of Ramadhan and Eid ul Fitri respectively. These two festivities are celebrated in Brunei and in many of the cities RB flies to. It is among one of the best times of the year to travel and immerse yourself in the observance of the season in the different cultures around the world. 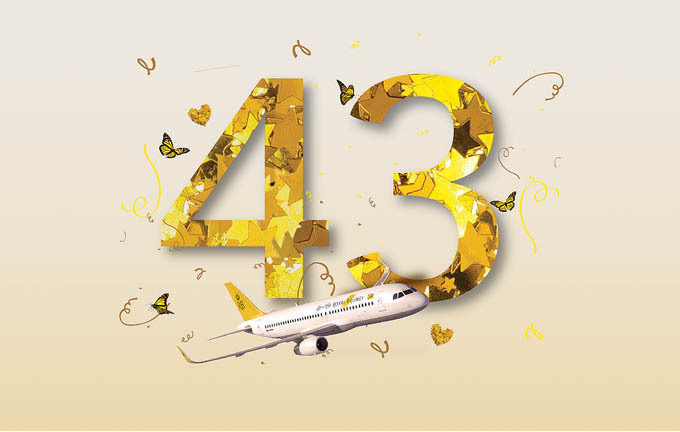 May is a very significant month for RB as well as we celebrate the 43rd anniversary of RB as the National Airline of Brunei Darussalam. Since the first flight on 14 May, 1975 to Singapore, RB has grown in leaps and bounds and this would not have been possible without the loyal support of our guests, and the hard work and dedication of our people. On behalf of the Board and Management, I sincerely thank the millions of our guests from all parts of the world for your support over the years and we look forward to welcoming you on board again in the near future. Exciting times are ahead of us as we welcome a major milestone with the delivery of our first Airbus A320Neo equipped with LEAP-A1 CFM engines. The state-of-art aircraft, which is also the world’s first narrowbody fitted with Thales AVANT (GEN5) in-flight entertainment system, will offer unmatched levels of in-flight comfort for an enhanced guest experience on board. These aircraft will have business, economy plus and economy seats with leather covering, USB power outlets and audio/video on demand at every seat. We are also pleased to announce the introduction of 1,000 entertainment options – from movies, TV shows and audio – across all fleet by June this year. With the gradual doubling of the entertainment options, we trust that you and your family will have all your favourites on your flight to make your journey more enjoyable. In other developments, we have also recently launched our Royal Brunei mobile app available for download on both Apple Store and Google Play. The app allows you to make and manage your bookings on www.flyroyalbrunei.com on-the-go more effectively on your mobile devices. Last but not least, we are extremely delighted to share that RB has been recognised as one of the winners in the 2018 TripAdvisor Travelers’ Choice™ awards for Travelers’ Choice Economy Class – Asia and Travelers’ Choice Regional Airlines – Asia. The TripAdvisor award for the world’s top carriers is based on the quantity and quality of reviews and ratings for airlines worldwide gathered over a 12-month period. The entire team at RB is extremely proud of this achievement. We thank all our guests for their continuous support and recognition of the improvements we have made in our products and services. I also would like to thank our staff for their dedication and hard work on the ground and in air that has allowed us to reach this milestone. As always, I would like to conclude with a sincere word of appreciation to you for flying with RB today and, for our part, our team remains committed to do their utmost to make sure you have a comfortable and enjoyable journey.